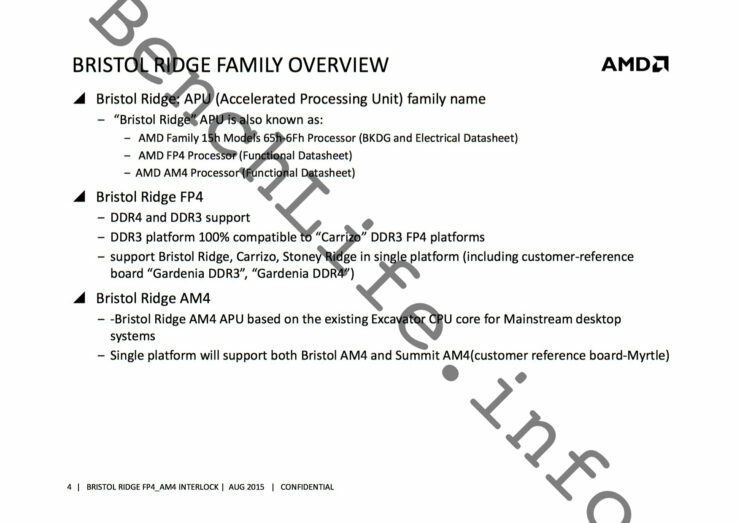 A rumor has emerged from Bitsnchips which alleges that AMD might introduce an insanely powerful APU under their Bristol Ridge family. 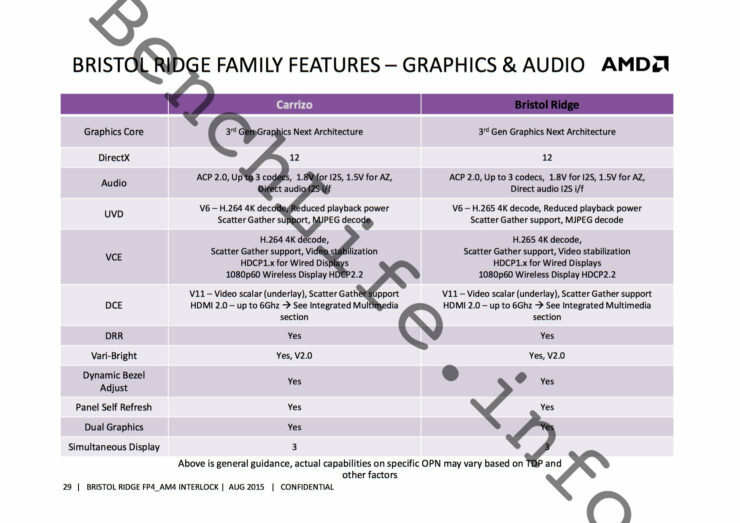 The Bristol Ridge family is the name of the upcoming family of mainstream APUs that will be featured on the AM4 platform. 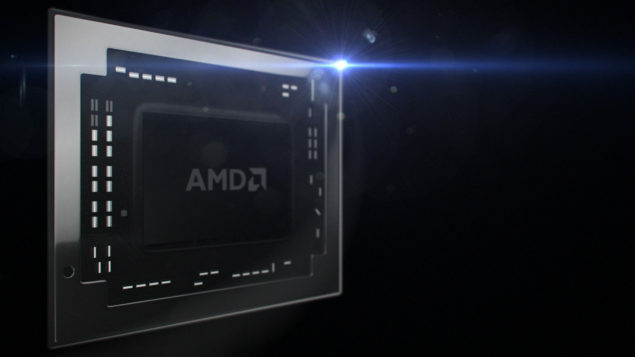 We have previously detailed a range of SKUs that are bound to be placed in the family but the rumored APU might be packing a serious punch at consoles if its actually planned by AMD. AMD Planning Bristol Ridge APU With 1024 Stream Processors – HD 7850 Performance? The AMD Bristol Ridge family will be the first to hit the AM4 platform that is expected to launch in June 2016. AMD may use Computex as a platform to showcase their new motherboards and their first processor family to be featured on AM4. 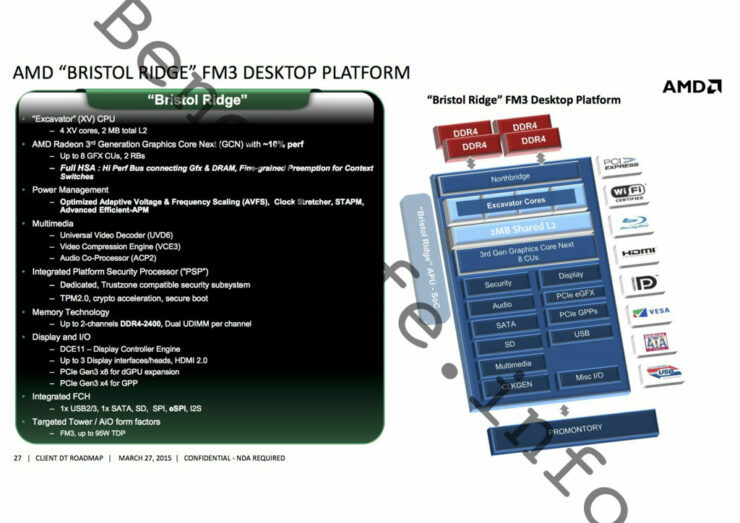 We have already seen a couple of leaks surrounding Bristol Ridge and rather than being a revolution to AMD’s APU family, the Bristol Ridge will mostly remain an evolution to the current Carrizo APUs. The main thing to note is that Carrizo was only limited to mobility platforms (notebooks). We saw some late introductions of Excavator powered Athlons in the lineup but those are limited to current sockets. 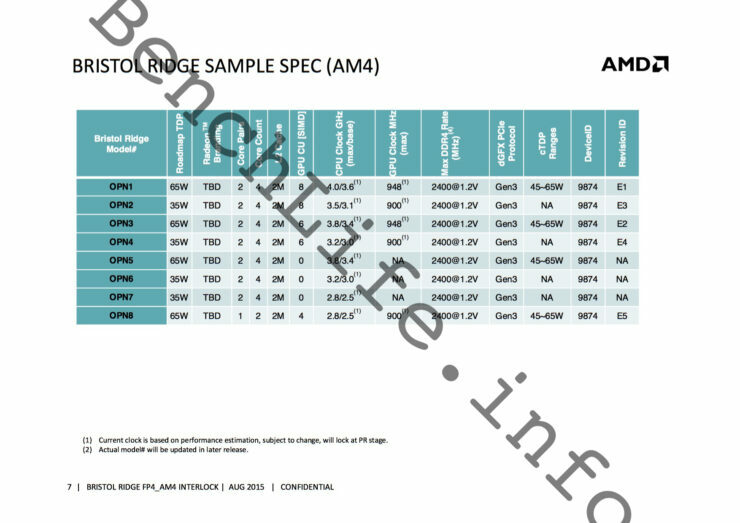 AM4 will be a huge departure from AM3+ and FM2+ as it brings the latest I/O and feature support to AMD motherboards with updated chipsets that allow the next iteration of storage and PCI-E capabilities. 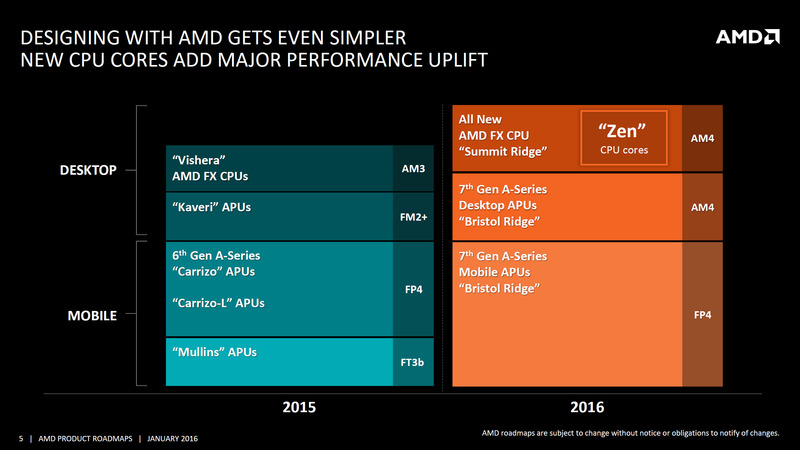 AM4 will be the first and foremost platform to support AMD’s latest Bristol Ridge APU family in mid-2016 and Zen based Summit Ridge FX family in Q4 2016. 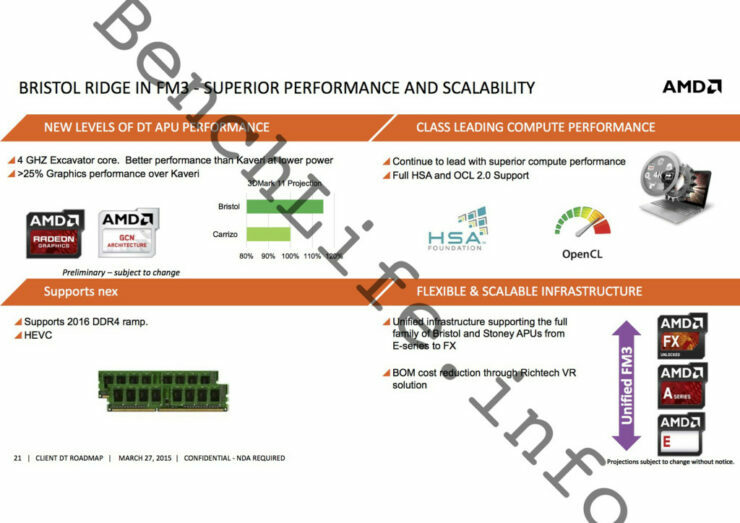 Straight from Bitsnchips, the rumor states that AMD is preparing a specific Bristol Ridge APU with 16 compute units that are based on the GCN 3.0 architecture. The 16 CUs mean that the chip would feature a total of 1024 stream processors which is the same amount of processors featured on the Radeon HD 7850. The Radeon HD 7850 graphics card launched back in 2012 and was particularly great in the budget department. Fast forward four years later and we could be on our way to see similar performance from an APU. he massive GPU part will require a lot of bandwidth to keep the bottleneck as low as possible since bandwidth became a noticeable bottleneck for even the 8 CU based Kaveri APUs on FM2+. AM4 will have support for dual channel DDR4 memory which can provide around 50 GB/s bandwidth which isn’t as much as the 153.6 GB/s featured on the discrete HD 7850 cards but lower clocks and power requirements will compensate for overall performance penalty where efficiency of the chip doesn’t get affected much. Since this is a rumor, we wanted to speculate whether a 16 CU part is even possible on the 28nm process or not and if this rumor makes much sense. A 16 CU part doesn’t seem way out of proportions as AMD already has beefier chips on the PlayStation 4. A Quad core chip with a 1024 SP GPU is very possible given the increase in density offered by the BHD process node. However, another possibility exists and that also makes a lot of sense for now. AMD’s marketing team loves to couple up the CPU cores and GCN cores when talking about total compute cores on APUs. 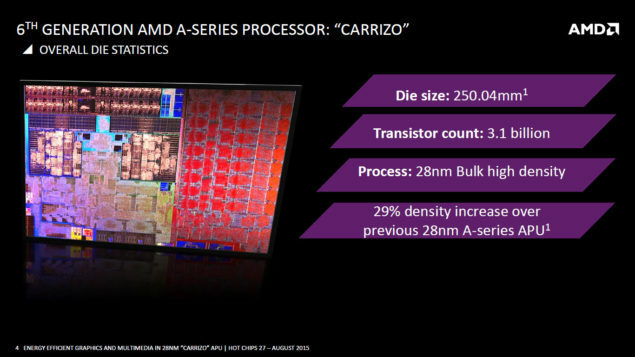 We saw with Carrizo that AMD announced they have a 12 Compute Core chip which had 4 Excavator cores and 8 GCN CUs. 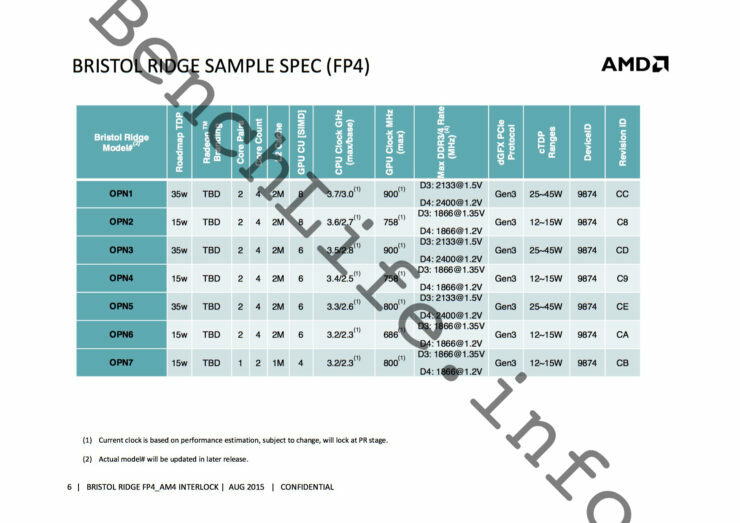 AMD’s Bristol Ridge is expected to keep the core count maximum to 4 that leaves us with 12 Compute Units on the GPU side. If that’s the case, we can see a 768 stream processor GPU which is still higher than the current Carrizo offerings and makes for a fast desktop class APU and about as powerful as Microsoft’s Xbox One console. But since this rumor points out to CU in the title, we will have to wait for actual confirmation by AMD to see if the SKU does actually exist. A quick glance at the technical features of both Carrizo and Bristol Ridge reveal no differences from both APU families. Both are based on a 3rd generation GCN architecture (GCN 1.2) which is the same version incorporated on the Fiji and Tonga GPUs. Both APU families have full support for DirectX 12, provide great audio, UVD, VCD, DCE features and support Dual Graphics, Panel Self Refresh, Dynamic Bezel Adjust along with the ability to run up to 3 simultaneous displays. Bristol Ridge APUs will feature up to four x86 Excavator cores with 2 MB of shared L2 cache. They will have support for HSA 1.0 and the latest DDR4 memory standard. The Excavator core ensures better IPC (Instruction per clock) versus previous generation cores.